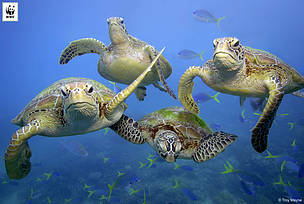 Green turtles are IUCN listed as Endangered (population decreasing). There are five species of turtle that are seen in New Zealand waters. A new Colmar Brunton poll, released today by conservation organisation WWF, shows 76% of New Zealanders support marine protected areas being able to be set up in our deep seas. “The government’s proposal for marine protection legislation, that only covers our coastal seas, is out of step with the vast majority of New Zealanders who love our oceans and want to see important habitats and animals in our deep seas protected,” said Alex Smith, Senior Campaigner, WWF-New Zealand. In December, the government proposed a new Marine Protected Areas Act to enable a network of marine protected areas to be set up. However, the draft legislation only covered New Zealand’s coastal waters - out to 12 nautical miles - and left out the Exclusive Economic Zone (EEZ) which covers deep seas out to 200 nautical miles and comprises around 95 per cent of our oceans. “Leaving out 95% of New Zealand oceans from proposed legislation aimed at looking after our oceans makes no sense at all,” Alex Smith said. “The National Party had previously committed to introducing marine protection legislation that would allow protected areas to be set up in our deep oceans. It was the main reason for developing new marine protection legislation. “It now looks like the government is planning to go back on these commitments in order to favour oil interests who don’t want to see some of New Zealand’s most important ecological areas put out of bounds for future oil exploration. “This goes against what New Zealanders want, the scientific evidence backing marine protection, and the National Party’s own original promises. An Official Information Act document obtained by WWF-New Zealand shows that the Petroleum Exploration and Production Association opposes the proposed MPA legislation covering the EEZ. WWF-New Zealand wants to see a network of marine protected areas set up across our oceans in order to safeguard life in our oceans. “New Zealand’s deep oceans contain a vast array of special wildlife and habitats. Penguins, albatrosses, petrels, whales, dolphins, giant manta rays, rare sharks, and sea lions all swim through or forage in the deep sea. There are amazing sea-mounts, trenches and deep water corals, many of which only exist in New Zealand that we need to look after as well,” Alex Smith said. For more details why the EEZ should be included in the MPA legistaton, click here.